Video games have been around long enough that they’re not just a curiosity. They are a bonafide part of the media landscape, one that rakes in billions of dollars a year. Like any part of the media world, though, there are niches that help to define parts of the fandom. One of the more popular niches is that of retro gaming. This is a type of gaming that eschews modern games in favor of those games released in the past. 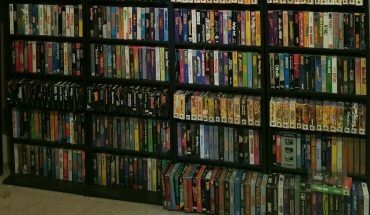 While there are many definitions of what is retro, there are a few factors that are good for any would-be collector to know. In short, retro gaming is any type of gaming that espouses a preference for older games than newer games. Typically speaking, retro games are largely confined to the console and arcade space. However there are a wide fan base of old Amiga, Sinclair Spectrum, C64 games that often get forgotten about. The Amiga was a giant for both roleplay (Ultima VII, Eye Of The Beholder), racing (Lotus Esprit Challenge) and platformers (Turrican 2, Flashback) to name a few. If you have no idea what those games are, for the love of all that is good, go check them out. The Amiga also helped to revolutionize how we made electronic music, with programmes like Fruit Loops and Octa Med starting out there. There is also a fair contingent of PC gamers who prefer older games. There’s no specific dividing line on what makes a game retro. Though it’s fair to say that anything made to work on current hardware probably doesn’t count. Instead, a retro game is more about feeling old than being old – it has to carry with it a certain sense of nostalgia that can’t be found in a newer game. It’s hard to point at what’s a retro console and what isn’t. Technically speaking, any console that’s more than a generation old will count. That’s why some gamers would point at the XBox 360 or the PS3 as being retro consoles even if they’ve only recently stopped being supported. Other games look back farther, with at least a decade of time needing to have passed before consoles fall into the retro sphere. It’s important to remember that a retro console just needs to play retro games, so it doesn’t have to be a first-party release. There are dozens of consoles out there that emulate old gaming software to allow players a better chance to interact with retro games. Because retro gaming depends so much on old software, there are many legal grey areas in the hobby. Most retro games aren’t necessarily played in their original format, but rather played on ROMs. These programs can be legal and licensed or they can be illegal dowloads; generally, it’s easy to tell which is which. If you don’t pay for the ROM, it probably isn’t valid. Some ROMs, though, are abandonware – products that no one sells any longer. While these are technically probably not legal, there’s no one around that can really prosecute the use of these products and thus they fall into a moral grey area. One of the best parts about retro gaming consoles is that they can squeeze quite a bit into a small package. The Pandora’s Box 5S is a great example of getting a lot with a purchase. Boasting a list of nearly one thousand games onboard. Everything on here is very much in the retro mindset, though you can’t actually use cartridges. Instead, you’ll get a thousand games pre-loaded in ROM form on the console for you to play as soon as you turn it on. This is really nice a piece of hardware for the most part. 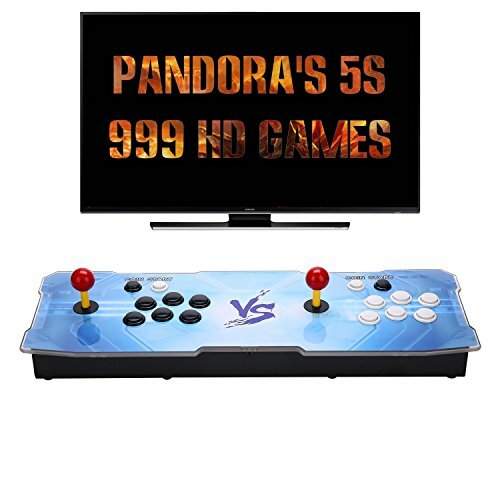 It’s great if you’re trying to set up a home arcade, for example, and it works very well with modern televisions. The joysticks are fantastic and work great with the older arcade games that are on the list. There are a few small technical problems here and there, but they’re easily hammered out with the amazing customer service. If you want something that you can set up quickly and play, this is probably a good console for you. It is also one of the best for reliving the look and feel of retro games. The control makes you feel like your standing in the arcade hammering out the old familiar buttons. It feels sturdy and well built, and it adds the physical ‘feel’ to the games that other systems lack. Let’s talk problems for a moment, though, because they are significant. As with most systems that boast such an amazingly higher number of games, you’ll have to search through a lot of garbage. There are some real winners on here like Contra, but you’re mostly looking through what look like home-brew games. There’s also no way to add more games to the system, which means you’re stuck with those games. The Raspberry Pi has done quite a bit for classic gaming over the last few years. This small computer is more than capable of running most retro games and a number of enterprising fans have found great ways to make these small units into great gaming machines. A good example of how the Raspberry Pi can work is found in the RetroPie Arcade Gaming Kit. It’s probably best to look at these retro gaming consoles as a kit for gamers. It’s not just a console, it’s actually a DIY system. Instead of coming pre-loaded with a number of game ROMs, this kit just comes with the Raspberry Pi, some software, controllers, and a nice case. From there, you can put together your very own retro gaming machine. The unit does not support any kind of cartridges. As such, you won’t be plugging in any physical cartridges of your old games. That means you’ll need to hunt down ROMs yourself and install them on the machine. However, the beauty of that is, you can pick and choose your own playlist rather than a pre-selected bundle. If you’re not particularly handy, this one might not be for you either. You’ll actually have to assemble the entire console. 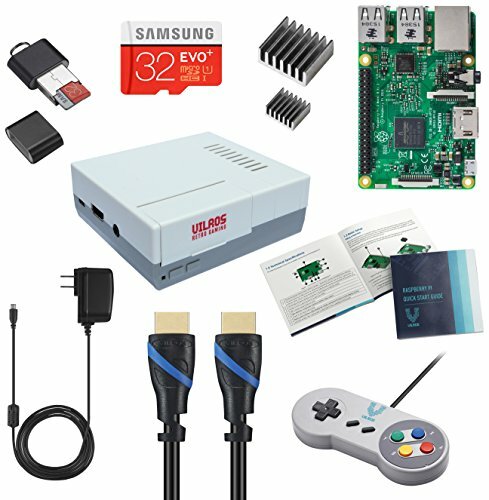 If you are looking for a personal retro gaming machine and you don’t mind doing some light computer building, though, this is a nice looking kit that works well once it is assembled. This is a great kit for those that want to build their own console, install their own software and games and tailor to their own desire. It’s great for learning basic electronics and computer building, basic code and a enjoying the fruits of your labor. Retro gaming relies quite a bit on emulation. The problem with emulation, though, is that you never really know what you’re going to get. All emulated games were initially made to work on very specific hardware, and what you’re seeing is the best attempt to make it work elsewhere. The end result can be seen across the Retro Mini GBA’s catalog. Perhaps the best thing about this system is that it has a good game list. There are over five hundred games on the list, some of which are portable classics. As with many retro consoles that come with built-in games though, there is no capacity to play physical cartridges. You won’t be able to slot in your old GBA cartridges to play those on this system. It does have a decent battery life, though, which means you can take this game with you and play to your heart’s content. Some of the games are not well emulated and are barely playable. These are few in number though and the vast majority work well. It is, however, prevalent enough that you’ll get frustrated with the system on a regular basis. This system exists to play ported games, and while it doesn’t always do its job particularly well, it is a relatively cheap and convenient way to play a ton of old retro games. There are hundreds of games in the retro gaming world, some that are real hits, others that are best forgotten. 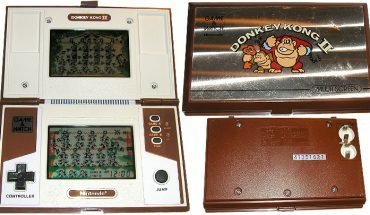 It is very common among retro consoles to include many of both. This makes sure that the list is big enough to draw in consumers. This is another console with hundreds of games available, but it’s good to note that the vast majority of them are actually well worth playing. The five hundred-plus games on this list are collected from a few different consoles. There are games from the Game Boy Advance, Sega Master System, Game Gear, and even the NES. While there’s a lot of detritus here, there are also a lot of great games (including the Super Mario Bros. series). The system is also able to be hooked up to a screen, which makes it one of the few portables on the market that can be played on a full-sized television. It’s certainly a good fit if you absolutely need a great collection of retro games. There are the usual negatives here, too. There’s a lot of bloat in the games list, to the point where half of the games could probably be comfortably taken off the list. There are also some poorly emulated games that make it hard to really enjoy what’s left. 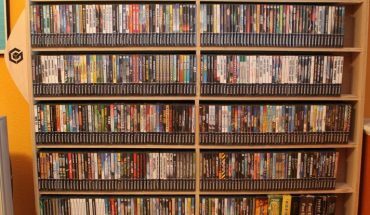 Finally, there’s no way to add more games – you can neither import ROMs nor use cartridges. That means you are restricted to playing what is on the list. It’s a good thing then that the list is expansive, abundant in great classic games from a variety of platforms. For the price it is a fantastic retro gaming console. 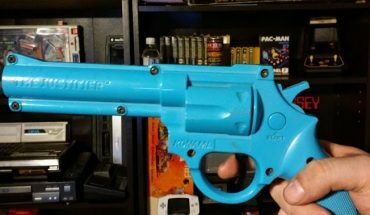 Retro gaming has finally become popular enough that even the real manufacturers are getting in on the game. SEGA has been one of the better companies about this, putting out a few good retro consoles over recent years. While some might argue they haven’t been up to the quality of Nintendo’s offerings, they are still a lot of fun. 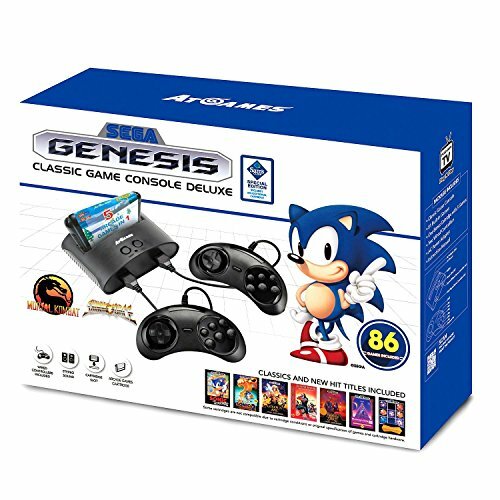 The best thing about this console is that it’s a real SEGA Genesis! While it ships with over eighty games on the hard drive and uses wireless remotes, it’s easy enough to take out your old cartridges and controllers to use them with the system. The eighty-six games on the hard drive are largely good, though, and very well emulated. You can play all of the classic Sonic games, along with some obscure favorites like Vectorman and classics like Mortal Kombat. As with most classic systems, though, there is a lot of bloat. Beyond that, though, the only other problem is the wireless controllers. They just don’t work as well as they should, so do yourself a favor and pick up some older Genesis controllers as replacements. Once you have those, you’ll have everything you need to have a great time with the Genesis. This is a bit of a weird one, as most don’t necessarily consider the PS Vita to be a true retro console. Considering that’s it still technically out there, it’s really just a generation old. However, it comes in under the definition of retro games and those who really love the Vita should probably pick up this kit instead of the actual portable console. The reason this is classed as a retro gaming console, is that it is a great platform to play not only PS Vita games, but also a wide range of the original PlayStation and PS2 games. What you’re really looking at here is a hybrid of a retro console and a TV streaming box. The PSTV is actually a great streaming device, so the fact that you can play a number of Vita, PS and PS2 games on it is just a bonus. You don’t just have to stream them, either – you can play actual Vita games here, so your collection isn’t going to have to gather dust while you are waiting to play. The Vita was notoriously under-supported by Sony, so you’ll also have a very limited number of Vita games to play. Some of those games are fantastic, though, and deserve a second look. As the games catalogue is greatly bolstered with PS and PS2 games, you won’t be short of games to play. The Raspberry Pi is changing the face of retro gaming in many ways. It’s important to remember that most older games don’t have very sophisticated software needs, so a micro-computer like the Raspberry Pi is perfect. Anyone can assemble a decent gaming platform for the Pi. There are a few companies that have made some great products with this computer as a basis. One of them is the RaspiBoy. The RaspiBoy is a system for those who want to play retro games on the go. It’s a small kit that allows you to convert the Pi into a gaming machine, one that requires you to download classic ROMs in order to play. It’s easier to look at this one as a kit than a true console, though, as everything is DIY. With a little work, you can make the console you want. The big selling point here is multiplayer. Many retro consoles based on the Pi don’t have that capability, but this one can go multiplayer with relative ease. With a few cords and extra controllers, you can transport yourself and your friends back to the day of the classic consoles as you play almost any multiplayer game for which you can find a ROM online. Retro gaming can be a great deal of fun precisely because of how customizable it can be. What you enjoy doesn’t have to line up with what everyone else loves – and that’s fine. It’s up to you to find the ROMs and old game copies to have a good time, so why not customize your experience. This, at least, seems to be the philosophy behind the Allcade. The Allcade takes the usual ROM-based retro console and makes it look good. The regular model takes the hardware and packs it into a classic arcade fighting stick. One that still allows players to plug in multiple other controllers for multiplayer fun. It’s an easy to use system. Albeit one that still requires you to do the work of finding games on your own. This might not be a plug-and-play solution, but it’s easier to use than many other systems. Get the games you want and play – and do it in style. It’s definitely a piece for serious retro gaming collectors, but the fact that such a solid piece of work exists really goes to show how important retro gaming has become. If there is a downside to retro gaming, it’s that no one console can do it all. No matter how hard you try, you haven’t been able to replicate the experience the process of putting in an old game and just expecting it to work. That’s where this new device comes in. A modular HD gaming system that actually runs some old games in their classic formats. The Polymega talks a big game, and the advertised features are truly amazing for fans of retro games. The Polymega is a modular system that uses a number of swappable elements to play older games in their classic formats. At the moment, the plans are for the system to play everything from the NES through the Playstation 1. Swappable units will allow players to use both cartridges and CDs. On the other hand, modern elements will allow for streaming and other modern gaming conveniences. This one is still in Kickstarter, so it needs support to bring it to life. It’s definitely a huge step forward in the world of retro gaming if it manages to survive the process. For once, gamers will be able to play some of their favorite games on one console without having to worry about emulation woes or half-done ports. Website: http://polymega.com/ – Watch out for the crowdfunding campaign for the Polymega this year! !